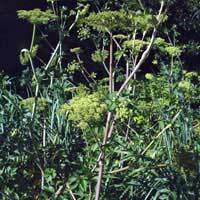 This large perennial can be found in moist areas along marine shorelines. Very salt water tolerant, this plant will attract butterflies with its large dome shaped greenish to white flowers. Late spring bloomer.